Pearlie and I share the same birthday. We are five years apart and in a few days we will be celebrating our 25th and 30th years together, as we have promised always to do. Unless of course, one of us is in jail – something my mom just told me I said when I was about 8 years old. Luckily, neither of us have been to jail yet. When we were much younger and living under the same roof, our parents used to throw these amazing backyard parties with taco trucks, puppies, and everyone that had blessed our young lives in attendance. I like to think that it was those parties – two kids sharing the same day – that helped to solidify what a strong bond my sister and I share. We are so incredibly lucky. It is perhaps for those reasons listed above that I have a strong reverence for birthdays. I like to think that they should be celebrated in parts – a few parties, gatherings, and karaoke embarrassments here and there leading up to the big real day. Next weekend, we’ll be heading up to San Antonio for the Lightning in a Bottle Festival with a big group of friends. Camping for four nights in a big huddled loving mess, daily yoga classes, and incredible music will be the perfect way to spend some sissy time and celebrate our lifelong love for one another. It’s mushy, but she’s my most cherished friend and I hers. But before that, my little Los Angeles family and I are having a dinner party. My dear friend Hannah was born only a few days before me. I can’t think of a more lovely, fancy person to share my candles with. She has just recently (and finally!) made the permanent move from New York to Los Angeles and I couldn’t be more pleased.Â I only hope that more of those silly, freezing-their-rears-off New Yorkers will take a cue from Hannah and me and do the same promptly. In the meantime, she and I have some birthdays to celebrate. 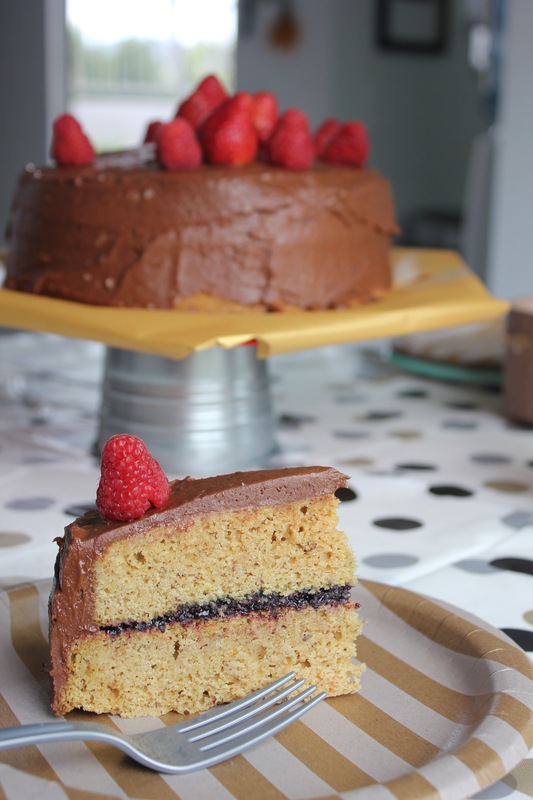 Being gluten-free and dairy-free makes the cake thing a bit hard to pull off. I’ve usually forgone such hopes as I can hardly remember the last time I was able to partake in the birthday cake ritual. Poor me, right?Â They’re probably not that great anyways… Until I tried this one. It’s just sweet enough but not too overbearing in chocolate flavor since the cake itself is a spin on a traditional yellow cake. Covered in vegan chocolate frosting, it holds together quite well around its ribbon of raspberry jam. 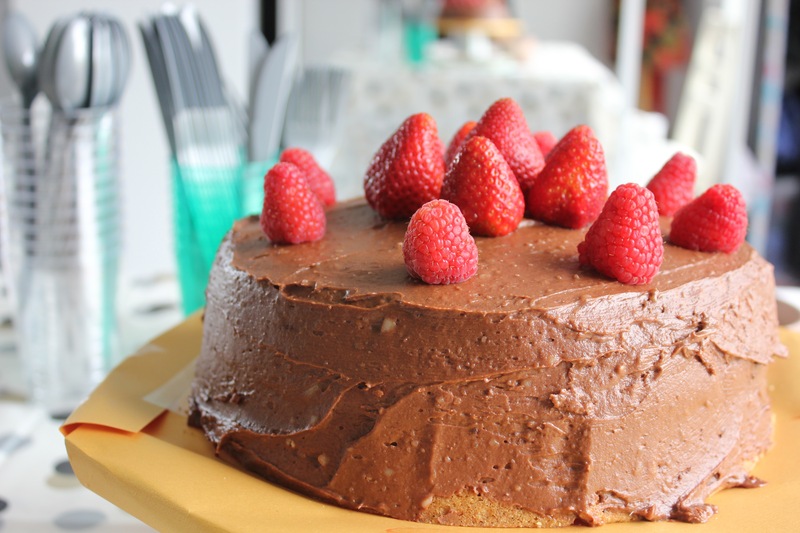 You can substitute any type of fruit spread for the center, or just slather on more chocolate frosting. I topped mine with fresh raspberries and strawberries but with all of the coconut oil used in its making, I imagine some coconut shreds would be great as well. I adapted this recipe from Ashlae over at OhLadyCakes.com to make it gluten-free and Olive and Pearl’s agreeable. This recipe is enough for a two-tiered 9inch cake. If you aren’t into layering, simply halve the recipe. Preheat oven to 350F and coat two 9inch baking rounds with coconut oil. In a small bowl, whisk the almond milk and vinegar to curdle slightly, set aside for ten minutes. In a separate small bowl, combine flours, baking powder and baking soda, and salt, set aside. In a large bowl, combine the oil, sugar, and vanilla. Slowly and in halves, incorporate the flours and almond milk into the oil and sugar mixture until well combined. Pour half of batter into each prepared pan and bake for 25-30 minutes or until tops are browned. My oven is a bit slow, yours make take less time so make sure you stay close to the oven when the cooking timer is almost up. Leave the cake to cool for about 30 minutes then invert them onto a wire rack. Cover and refrigerate until they are cooled completely before frosting. In the meantime, prepare the frosting. In a medium bowl with a hand mixer or, in a food processor fixed with a paddle attachment, cream together the butter, oil, milk, and vanilla. Sift in the powdered sugar and cocoa powder and whisk until well combined. Leave in the refrigerator to set until you’re ready to frost the cake. 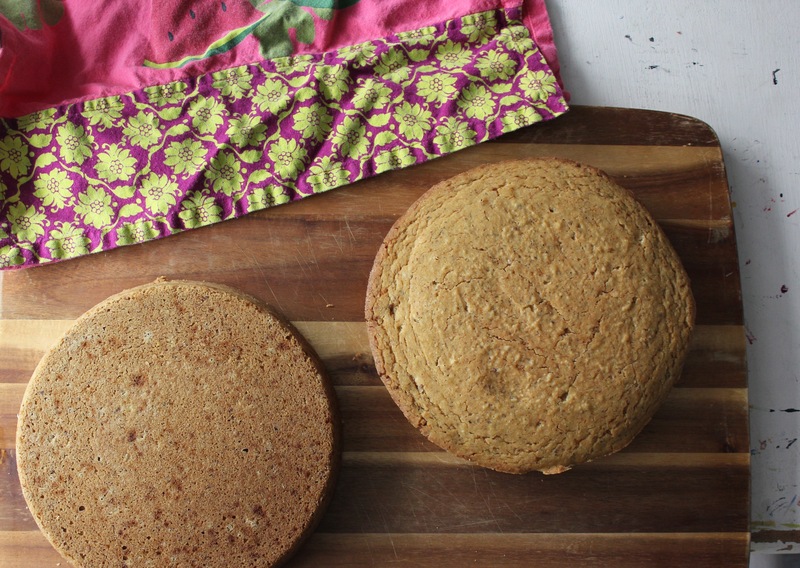 Remove the cooled cake from the fridge and place whichever you’re using for the bottom onto a flat serving dish. 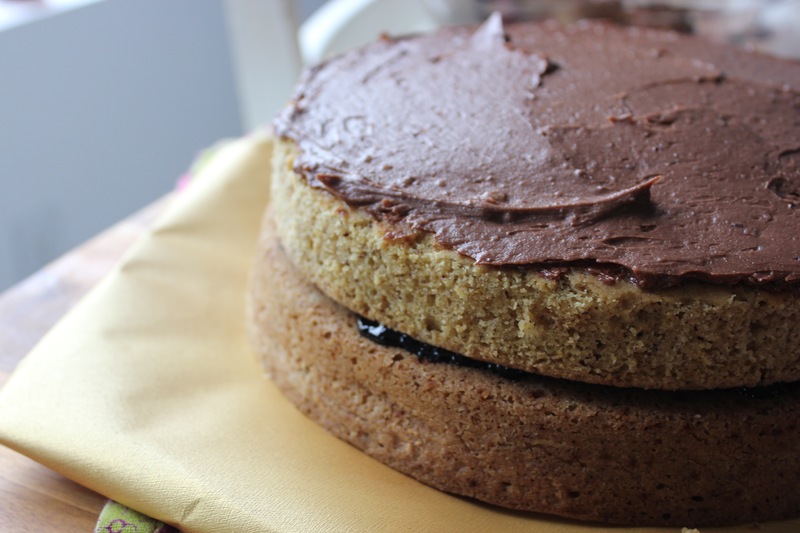 Spread enough jam onto the top of the cake to cover completely, leaving a centimeter around the edges. Carefully transport the next cake directly on top of the bottom layer, ensuring that it is center. 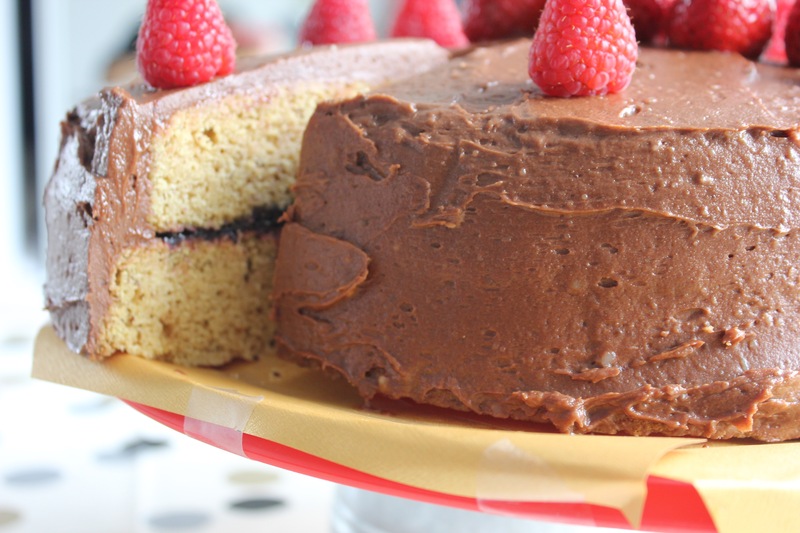 Spread a generous amount of frosting onto the top of the cake with a kitchen knife. Make sure not to divot the cake and spread crumbs into the frosting. Spinning the cake as you work, use the flat end of the knife to cover the sides completely in frosting. Top with berries, coconut, shaved chocolate ribbons, or whatever you have on hand and serve immediately. May be kept covered in the refrigerator for a few days.